One of the most important pieces of equipment I bought when our boy was born was a thermometer. I had no idea which to buy so I bought a basic one which did the job (when it would switch on! ), it lit up red if a fever was present and green if not. The downside these days is 2 fold - 1 my boy always wants to get involved with having his temperature taken and 2 I have to touch him to take it. Now I know that sounds a little odd, but if he's asleep or just resting the last thing I want to do is disturb him and it appears Braun have been listening. 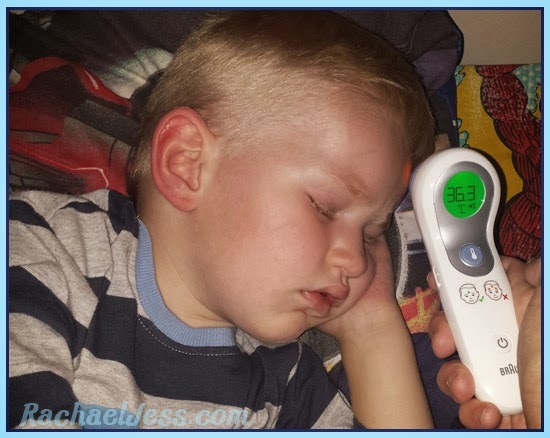 Sometimes it is necessary to monitor a fever every few hours and waking a child to do this can add to an already stressful situation for the parent, and it is with this in mind that Braun has launched this new no touch and forehead thermometer which we were fortunate enough to trial. I love the new thermometer! It has colour coded displays with or without sound. It has a soft light so you can see where you are placing it on your child and the shape is ideal to keep a solid hold with no flimsy handle. It is also suitable from newborn. The price is £52.99 and available at Asda, Boots and all good baby specialist retailers. I know this thermometer is not cheap but it has professional accuracy and gentleness which will last, can be used on all the family and is far more accurate than a flimsy thermometer for a couple of quid. 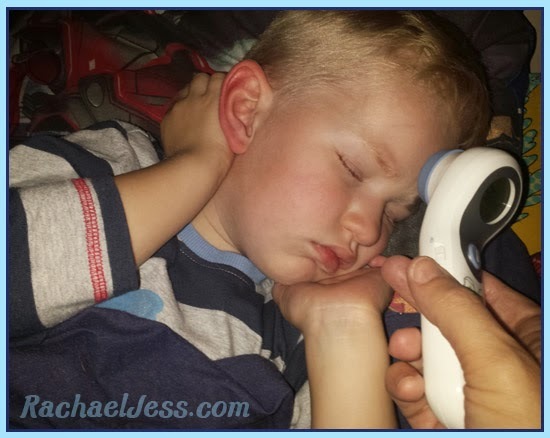 Make sure you know how to check temperature accurately and get your child used to it too. Making it into a fun game can make the process easier, especially if they’re not feeling well. Likewise, if your child gets upset when having their temperature checked, think about using a ‘non-touch’ thermometer. Babies will often feed more when they are hot, both for comfort and to stay hydrated. You may find that they take less feed, but more often. For children that have been weaned, offer them cool drinks or ice-lollies when they are bothered by fever. This is a great way to help them feel more comfortable. If your child is hot, reduce the number of layers they are wearing to help them cool down. This applies to both babies and older children. Babies primarily lose heat through their heads, so when they are hot make sure their head is uncovered. Older children will lose heat through sweating and so ensure they have regular drinks when they have a fever, to keep them hydrated. At night when your child goes to bed, cover them in a single sheet, rather than a duvet. For babies, the sheet should come up to their armpits and not cover their heads. Make sure that the room your child is in is a normal temperature (around 18 degrees centigrade), so turn down the heating or open some windows. However, it shouldn’t be so cold that it is uncomfortable. Do not use tepid sponging to cool your child down. This isn’t very effective and may actually be counter-productive. There are medicines that can help to reduce your child’s temperature, such as paracetamol and ibuprofen. Make sure you always follow the dosage instructions or check with a healthcare professional if you are unsure. Know when to seek further help. You should keep a close eye on your child when the thermometer reads ‘elevated’ (yellow), and seek medical advice if it reads ‘high’ (red), or if they have any other worrying signs (such as a rash, floppiness, breathing difficulties, fits or signs of dehydration). Any child with a fever that lasts more than 5 days should be checked by a healthcare professional. 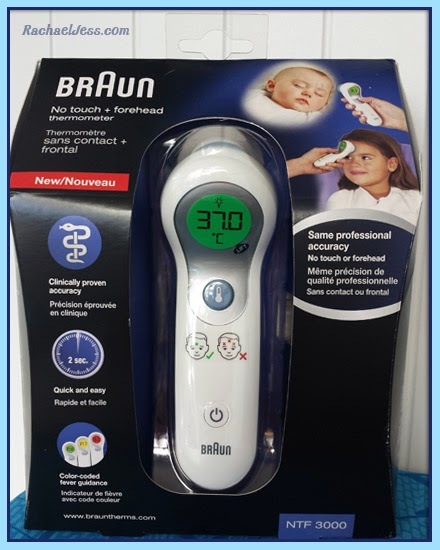 Disclaimer: I received a No-touch & forehead thermometer from Braun to review. The opinions are my own and not influenced by the product received. Such an amazing invention! 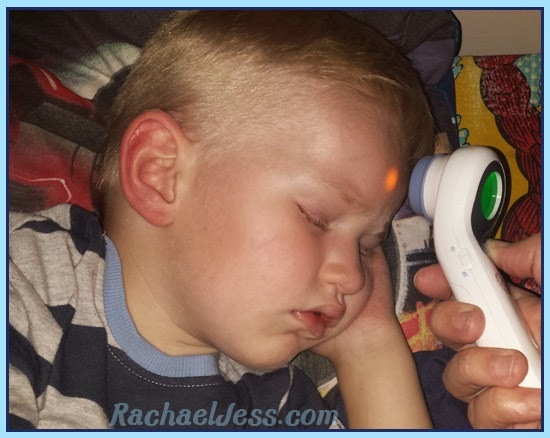 We have the braun ear themometer and I honestly don't know how we would have coped without it as it is so accurate - but this one sounds even better because it doesn't disturb the child. Great review and great tips! Thanks Rebecca, I honestly don't know how I've been 'making do' for so long!! I love this new thermometer.